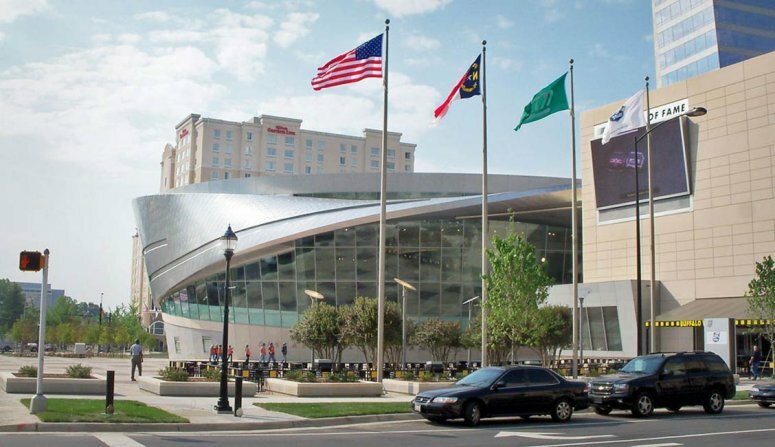 Genesis Structures used LUSAS finite element analysis to assist with the design of a complex structural �ribbon� that wraps around the roof of US National Association for Stock Car Auto Racing (NASCAR) Hall of Fame building. The ribbon includes a 160 foot long mobius-like section that spans the entrance to the facility providing an eye-catching visual interpretation of the banked race track and speed that is typical of the sport. 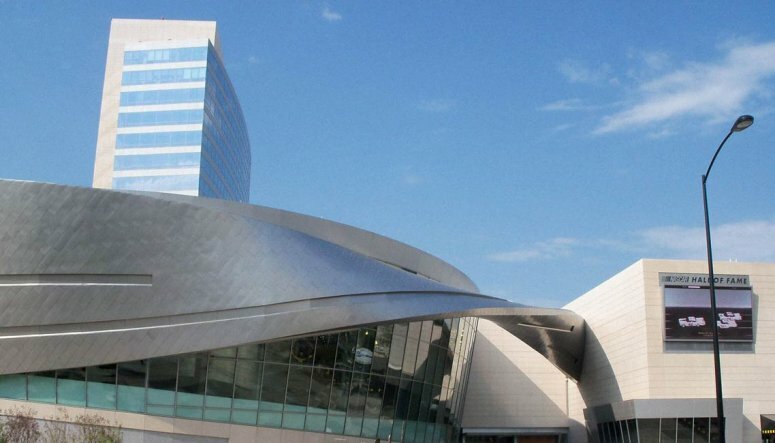 Located in Charlotte, North Carolina, the NASCAR Hall of Fame is an interactive entertainment attraction that honors the history and heritage of the sport. 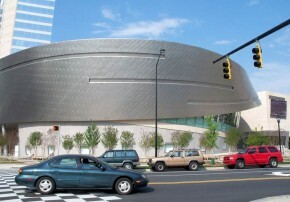 Designed by Architects Pei Cobb Freed & Partners of New York, the building is topped by a flowing �ribbon� that begins as a curved sloping exterior wall on one side of the building before twisting in a free span over the main entrance to form a signature canopy, and then reappears to the rear to fully surround the building. Clad in stainless steel, its shape is intended to symbolise the banked tracks of the racing circuits and the long, thin recesses in its skin suggest the blur of cars racing at speed. 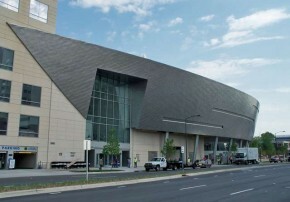 Zahner of Kansas City, Missouri, was awarded the construction contract for the exterior ribbon feature of the building. 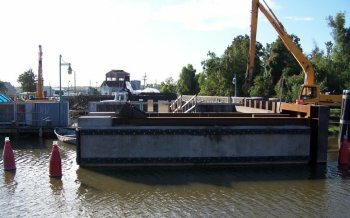 Zahner employed Genesis Structures for its structural engineering expertise in this type of work which included ribbon wall panel design, the design of the mobius-like ribbon structure and erection engineering services. 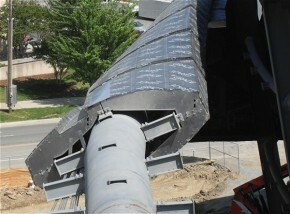 The wall system that makes up the ribbon is constructed from aluminum panels that are approximately 8 foot in width. Wall heights vary with the tallest being in the region of 45 feet. Using a proprietary aluminum extrusion system, developed by Zahner, Genesis optimized the design and fabrication of the curved planar surface by employing a cold-formed aluminum decking system, supported by horizontal built-up, curved ribs to form the surface of the dynamic wall. Wall panels were erected on steel spandrel beams designed by the building structural engineer, LERA. Specially designed anchors allowed for small amounts of vertical field adjustment to ensure perfect alignment. 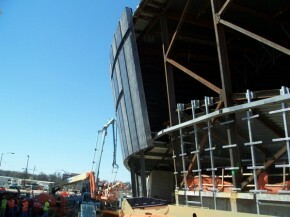 The primary feature of the exterior wall system is the mobius ribbon structure, which spans more than 160 feet above the entrance to the Hall of Fame. The mobius is supported at one end by a structural concrete shear wall and at the other by a fabricated structural steel framing support system. To analyse the mobius ribbon structure a detailed LUSAS model of the building framing system was built to ensure the correct structural response was being captured. Because of the unique geometry of the supporting framing system, a detailed local model of the steel mobius support was also created. 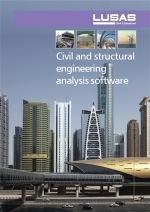 Stress and temperature effects were investigated and results obtained were provided to the building engineer of record to confirm their own design assumptions and verify that the correct structural response was being captured. The design of the mobius structure called for a 48-inch diameter by 1.50�inch wall thickness pipe fabricated in chorded segments. Genesis Structures worked closely with Zahner and the steel fabricator, Schuff Steel, to develop cambering and final segment geometry to accommodate the finished geometry required by the architect. 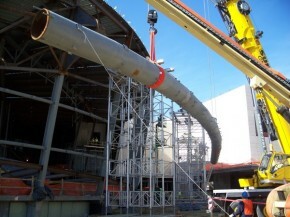 Genesis Structures worked directly with the steel erector, Duggins Welding, to provide exact center of gravity locations for the mobius and also with Zahner to develop the required camber in the pipe system for fabrication and erection. The mobius pipe was lifted into place and supported on falsework towers to allow welding to the two support locations to take place. 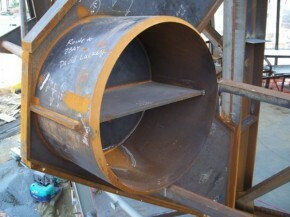 After the falsework towers were removed the mobius pipe came to rest less than 5/8" from the calculated design position. 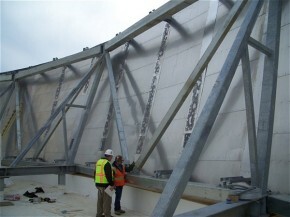 Final exterior geometry of the structure was obtained by connecting a series of aluminum panels, approximately 8 foot in width, to the pipe in its fully erected configuration. 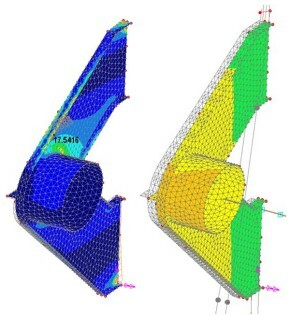 "We used LUSAS to perform a complete dynamic response analysis of the mobius structure and worked closely with the wind specialist for the project, RWDI Inc., to develop a complete set of structural design wind loading combinations including as drag and torsion, to completely assess the structural demands on the system."